1. 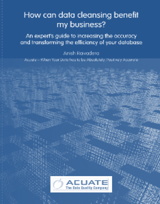 Technologies that help improve data quality – this should include the ability to deduplicate, create single customer views for B2B and B2C databases, can handle the volume of data you have, perform all the standard cleansing routines for UK and International data, have Data Stewarts available, and access to cost effective data suppliers. 2. Off shore – off shore facilities are suited to data quality because many of the tasks can be manual and it is expensive to hire temps here. Off shore staffs are equally able and because of the supply of resources, often off shore staffs are more capable then the job requires. 3. Use Data Bureaus – certain data tasks can be performed by bureaus as they have automated systems to perform routine data cleansing or data appending routines. A data bureau is not suited to be your overall data quality supplier because of their limited range, but the right supplier can liaise with the data bureau and get you costs effective prices. Data quality need not be expensive, but if ignored or trying to do it yourself, then it can be expensive.